Spring is near, and as the outdoors bloom and the weather finally gets warmer, SysAid is also growing in a new and fresh direction. In less than one week, we'll be launching a new and improved website! With a sleek new graphic design, the website is intuitive, user-friendly, and mirrors SysAid's constant commitment to innovation. In addition to tutorials, documentation, and FAQs, we will constantly be updating and adding more resources on our products and services. To get a taste of the new website before its official launch, check out a screenshot sneak preview! 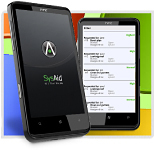 This March also marks a milestone in our commitment to mobile technology: SysAid's mobile application will soon be available for Windows Phone 7! Windows Phone 7 is the latest smartphone to hit the market, and with our free app, you'll be able to manage your help desk from even the hottest mobile device. 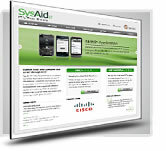 For those of you who don't already know, SysAid is in a continuous state of optimizing our Online Help, what we like to call Online Aid. Gain insights and tips not only from our technical documentation, but also from the SysAid Community! This month, SysAid's mobile application will be available for Windows Phone 7! Already available for iPhone, BlackBerry, and Android, the app allows you to manage your help desk and assets directly from your smartphone - and it's free! We are excited to announce that next week we'll be launching our new website! With a new design and simpler navigation, you'll be able to access pages faster and more easily. All the information you need will be right at your fingertips! Have You Met Joe the IT Guy Yet? SysAid's animated IT guy has reached a milestone this month with over 1,000 followers on Twitter. We're beginning to think that our Joe is a real social butterfly... or his tweets are just so tech-savvy that everyone wants to be his friend. Come see for yourself. How do you participate in tech community forums?